‘My Hero Academia’- Izuku Midoriya. Image Courtesy IMDB. Confession: I have never watched anime. It is one of those genres that has always seemed intimidating to me, and although I wanted to see what it was about, the choices were overwhelming. Where exactly does one start when it comes to choosing something to watch? This is where it helps to have a friend who knows what you like and can help you find the right place to start. In my case, my friend recommended I give My Hero Academia a try based on my love of Marvel’s X-Men. My Hero Academia, or MHA, is an anime that tells the story of a group of teenagers with special abilities, or “Quirks”, attending a unique university where they can use those quirks to become professional heroes. Intrigued, I searched online and found that I could watch MHA on Hulu, so I settled down one night and turned it on. Almost immediately, I was drawn to the spiky green-haired main character, Izuku “Deku” Midoriya, a teen who had no quirk himself but still wanted to be a great hero like all of the pros that he fanboyed over. A chance encounter with his personal idol, All Might, gives him the opportunity to be the hero he desires to be and Midoriya finds himself attending the hero university as a member of Class 1-A. The more I watched, the more I realized that anime was almost exactly like every other genre of television I have encountered. There is the character that draws you in immediately, the ones you decide are your close favorites, the ones you immediately cannot stand, and the ones that you would not be heartbroken to see meet a tragic fate before the end of the first episode. Now that I am over 30 episodes in, I can say that my initial feelings have not changed all too much. While my favorite character is now Shoto Todoroki, most everyone else has remained in the same categories. I still love Midoriya and I still would not be that sad if Katsuki Bakugo fell into a deep pit and never recovered. 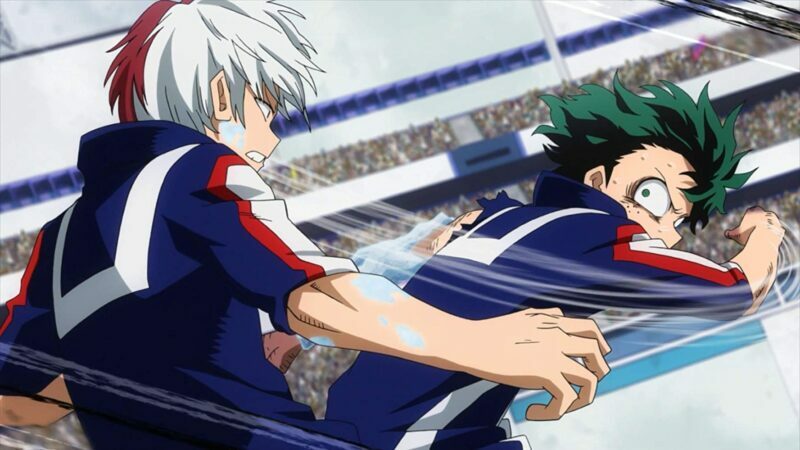 Midoriya competes against Shoto Todoroki in the school’s sports festival. Image Courtesy: IMDB. The depth of the characters was also surprising. These are not one dimensional children who simply show up and fight every day. They each have their own backstory, some more dramatic than others, and layers that make you care about them even more once they are revealed. There is also the comedic element, such as when hot-tempered Bakugo has to be chained up to accept a first place medal after a battle he does not feel was worthy of him. One of the biggest challenges I faced was deciding if I wanted to watch the show in Japanese with English subtitles or if I wanted the English dubbed version. For the experience, I chose the former. Four episodes in it became clear that I was not nearly focused enough so I restarted the series and went for the English dubbed version. That made all the difference. Now, I could actually concentrate on the show and not the box of words at the bottom of my screen. If you are new to anime and have the option of a dubbed version I recommend you start there. Choose the one that makes it easiest for you to enjoy. What surprised me the most was how intensely I began to enjoy MHA. How much I wanted Midoriya and his friends to succeed in every episode. And how much I wanted all of the MHA merchandise I could get my hands on. Luckily for my wallet, I limited myself to a Todoroki t-shirt and some new stickers for my laptop. I have also begun planning a gender bent Todoroki cosplay costume. Cosplay is also something that is brand new to me, but the more I watch MHA the more I want to dress up as my favorite hero-in-training. I am positive that MHA will not be the last anime I ever watch, but I am happy that it was my first. I am not sure any other would have been nearly as perfect for my getting my feet wet in the world of anime. If you have ever been curious about anime but unsure of where to begin, I highly recommend giving My Hero Academia a try. Previous story Disney’s ‘The Hunchback of Notre Dame’ Live Action Movie Announced!